John Williams is the head of the Advertising Injury Litigation Group. His practice focuses on intellectual property, counseling and litigation, complex class action and commercial litigation arbitration, and product liability litigation. His experience includes trial, international arbitration, mediation and appellate practice. copyright infringement and unfair competition suit involving a medical website database in the Northern District of California. several construction copyright infringement actions in Federal Courts in Florida, New Jersey, Kansas, Georgia, Arkansas, Colorado and Michigan. copyright infringement suit in the Southern District of New York involving a notable Tribeca condominium building. several copyright infringement cases involving jewelry in Federal Court in New York and Atlanta. many copyright infringement suits involving allegedly pirated computer software in Federal Courts in Alabama and Texas. copyright infringement suit involving furniture design in the Southern District of Florida. copyright infringement case related to music recordings in the Middle District of Tennessee. copyright infringement case involving computer electrical components in the Northern District of Illinois. copyright infringement claims against a prominent international circus arts provider. trademark infringement suit involving competing banks in the Northern District of Illinois. trade dress and patent infringement suit involving worldwide distribution of sink disposals in the Northern District of Georgia. trademark infringement suit involving luxury fashion products in the Southern District of New York. trademark and trade dress infringement suit involving licensed jewelry design of prominent fashion model in the Southern District of New York. trademark infringement action related to jewelry internet websites in the Western District of Washington. trademark infringement case related to use of marks in metatags, metadata and uniform resource locators on internet websites in the Southern District of Florida. trademark infringement suit related to alleged counterfeit and grey market automotive replacement parts in the District of Minnesota. right of publicity and trademark case in the Northern District of Georgia involving the use of the image of musician Jerry Garcia. multiple right of publicity suits in Florida state court involving professional bodybuilders and professional models. right of publicity case in Ohio state court involving images of a model in advertisements for a national medical society. defamation counterclaim as part of a complex construction antitrust case in the Northern District of California. commercial defamation and unfair competition suit in Kansas state court involving a restrictive covenant. commercial defamation case involving a Colorado real estate firm in the District of Colorado. John has written and presented on numerous intellectual property issues. He co-authored the featured article in the American Bar Association Entertainment and Sports Lawyer, Spring 1999 edition, titled “Mortal Kombat: The Impact of Digital Technology on the Rights of Studios and Actors to Images and Derivative Works,” which analyzes ownership interests in derivative versions of film and other entertainment products created with digital technology. successfully defended multiple class action complaints across the country relating to a prominent videogame. achieved dismissal of complex tortuous interference and professional negligence suit relating to a major highway construction project in Florida state court. successfully defended multiple RICO, fraud and misrepresentation suits in California state court and in the Ninth Circuit Court of Appeals. successfully represented worldwide mining conglomerate in simultaneous arbitration in Singapore and litigation in United States District Court to obtain contractual relief from a foreign power facility and domestic power company. obtained summary judgment for Indonesian energy company in the Southern District of New York against a Hawaiian power company for breach of long term coal supply contract. PT Kaltim Prima Coal v. AES Hawaii, Inc., 180 F. Supp. 2d 475 (S.D.N.Y. 2001). John has extensive product liability litigation experience and has successfully tried to verdict numerous product liability cases. He has successfully represented manufacturers of a wide variety of products including, automobiles, automotive component parts, industrial chemicals, and propane cylinders. His representation of entertainment companies has resulted in dismissals of several high-profile media violence cases across the country. 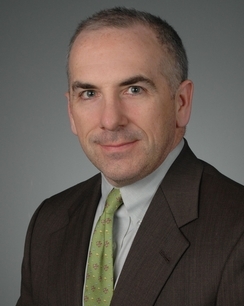 John is the co-author of Illinois Product Liability Practice, “Pleadings, Motions and Third-Party Practice,” for the Illinois Institute for Continuing Legal Education. John T. Williams named Super Lawyer for Intellectual Property Litigation and Personal Injury Defense: Products in 2011 Illinois Super Lawyers. HWW Partner John Williams Author of Chapter in New Product Liability Treatise.